Import WSDL Schemas does not work. Many users have posted this issue earlier (ID 97271, 49300, etc.) and yet unanswered. I tried Customer Service example in getting started PDF and faced issue in 6.3.1 Later I tried 6.4.0M1 but didn't work. There was a bug supposed to be fixed TESB-18388 but it still continues. I tried Airport tutorial and imported the project successfully. I saw the service in Metadata->File XML. Then I cleared the metadata and tried importing Airport service. It didn't work. There is one post about WSDL must be WS-I compatible. I checked in SoapUI. It shows compatibility. 1. What is fix of this problem? If the issue is random (somehow importing works for shong, Talend tutors), what is permanent resolution? 2. A workaround seems creating separate request and response XML for input and output respectively. But how to define those XMLs from a WSDL? details steps are needed. 3. in tXMLmap, when we say payload-> Import from repository, why just File XML is given as option? why not Metadata -> Web Service? 1. Can you upload the WSDL file or email it to me for testing? 3. Selecting 'Import from repository' option, it will let you to import schema from Metadata. I have tested it on version 6.2.1 and it is working. Thanks Shong for taking this up. I have attached a WSDL created as per steps in Getting Started guide. The CustomerService service doesn't import in metadata. 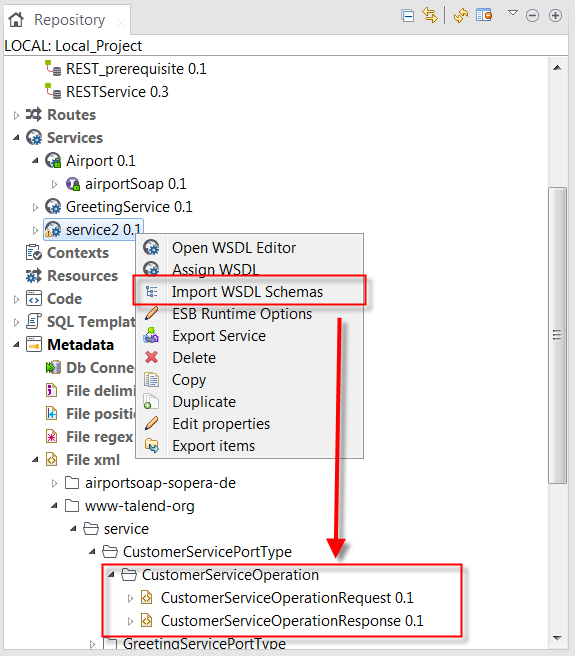 Also I have attached airport WSDL from another tutorial (100.zip) which when tried to Create Service -> Import Existing WSDL with 'Import WSDL schemas on finish' checkbox checked results into a mesg - Populate schema to repository:Error during schema processing. The related project zip (ESBTutorialProject.zip) for airport imports successfully and shows service in File XML in metadata. When I delete the service in metadata and try 'Import WSDL schemas' for the newly imported service, nothing is imported. About the #3, alongwith File XML and Talend MDM, a third option 'Web Service' of the metadata should be available. Which tutorial are you reading? I think the tutorial might be outdated. The attachments are not available, can you please send them to me via email? and following steps mentioned in the PDF. Did you see the WSDL files I sent through email? The WSDL I sent is generated from the steps mentioned in above documentation. I also import the airport service and run the AirportConsumer job to call the web service, it is working. I am using Talend Open Studio for ESB 6.3.1. As the WSDL is still not working in my Talend ESB Studio, tell me how can I diagnose? debug? see appropriate logs? what levels? Any config setting to check? any Jar to import? I checked in the log and found an error about path. Then I realized that there is a space in the path (I had installed Talend in 'Service Bus' folder). I reinstalled Talend in a folder having name with no spaces. It worked. Great, glad to see you get it working now.